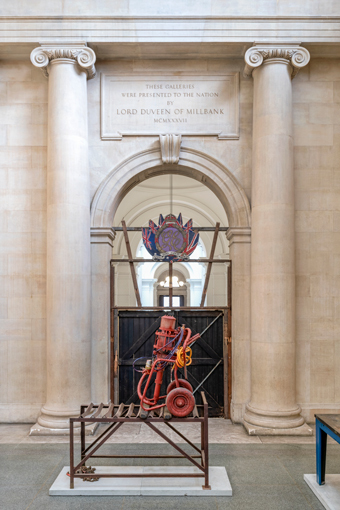 Tate Britain has today unveiled The Asset Strippers, a major new work by Mike Nelson, created for the annual Tate Britain Commission. Supported by Sotheby's, the Tate Britain Commission invites artists to create a new artwork in response to the grand space of the Duveen Galleries. For this project, Mike Nelson has transformed the heart of Tate Britain into somewhere between a sculpture court and an asset strippers' warehouse, carefully selecting objects from a past world - the post-war Britain that framed his childhood. For Nelson, interested in the cultural and social contexts behind the selected objects as well as their material qualities: "Their manipulation and arrangement subtly shifts them from what they once were into sculpture, and then back again to what they are. The exhibition presents us with a vision of artefacts cannibalized from the last days of the industrial era in place of the treasures of an empire that would normally adorn such halls."